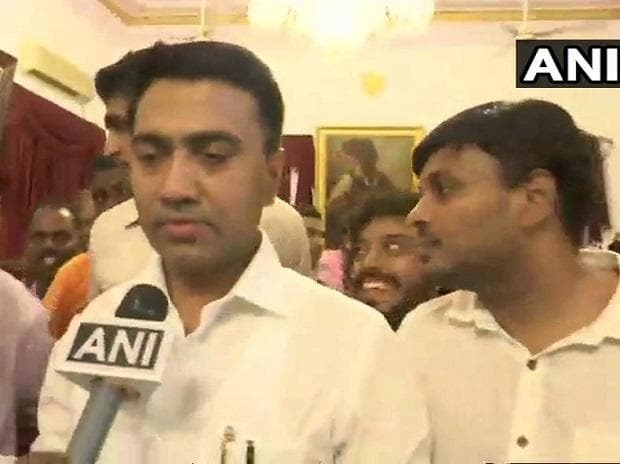 BJP MLA Pramod Sawant was sworn in as the new Chief Minister of Goa just before 2 am Tuesday, capping a day of hectic parleys between the saffron party and its allies to put a new government in place in the state. After multiple postponements of the oath ceremony on Monday, the day when his predecessor Manohar Parrikar was cremated with state honours, Sawant was sworn in by Goa governor Mridula Sinha at Raj Bhavan at 1.50 am. Sinha administered the oath of office and secrecy to the 46-year-old legislator from Sankhalim in North Goa. The Governor also administered oath to 11 other ministers, including those from BJP's allies MGP and the GFP. Interestingly, all the ministers who were part of erstwhile Manohar Parrikar-led Cabinet were sworn in by the Governor. MGP's two MLAs Sudin Dhavalikar and Manohar Ajgaonkar were sworn-in, while Goa Forward party MLAs Vijai Sardesai, Vinod Palekar and Jayesh Salgaonkar also took oath. BJP MLAs Mauvin Godinho, Vishwajit Rane, Milind Naik and Nilesh Cabral also found a place in the Sawant-led Cabinet. Independent MLAs Rohan Khaunte and Govind Gawade were also sworn in by Governor. As per the power-sharing arrangement reached with allies, an MLA each from two small parties backing the BJP in the coastal state will be made deputy chief minister, party sources said. Senior BJP leader Nitin Gadkari, the party's Goa in- charge, was present at the oath-taking ceremony. The new government was sworn-in with the support of 20 MLAs, including 11 from the BJP and three each from GFP, MGP and Independents. All the MLAs supporting the coalition were present at the swearing-in ceremony. Before taking oath as the CM, Sawant resigned from the post of Speaker of Goa Legislative Assembly. Deputy Speaker Michael Lobo would be officiating as Speaker till election for the post was held. Goa witnessed hectic political activity after Parrikar died Sunday, following a year-long battle with pancreatic cancer. Gadkari, who began a series of meetings with BJP's coalition partners since Sunday, finally managed to have a consensus over the leadership of Sawant. Sawant will now have to prove his majority in the Assembly. The oath ceremony, held at a cramped Raj Bhavan, was to take place at 11 pm Monday but was delayed due to inexplicable reasons. Talking to reporters, Sawant credited Parrikar for brining him into politics. There were a series of meetings involving the Goa Forward Party and Maharashtrawadi Gomantak Party's three MLAs each, an equal number of Independents, and BJP legislators since late Sunday night to reach a consensus on Parrikar's successor. Union minister Nitin Gadkari had flown into the state early Monday to lead the discussions. BJP chief Shah, who was also in Goa, is learnt to have supervised the party's bid to garner the numbers to stake claim to form government.